Author Edgar Browning presents a pictorial review of highway construction in the Buckeye State from the 1930s through 1960s. 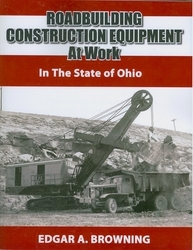 Chapters cover the Ohio Turnpike and the operations of forty different contractors. All phases of work are shown, along with a number of very rare and unusual machines. 168 pages, softbound, over 300 B&W photos.